With some areas in the country still experiencing snow, it’s hard to believe that spring is just around the corner. But in fact, late February is a great time to start planning your spring gardening projects and even do a little planting. For many of us, this means searching through all the clutter in the garage to find the gardening tools that seem to have gone missing sometime during the winter. If getting started in your garden will require you to do some digging in the garage, you may want to think about adding some additional storage. Fortunately, More Space Place has plenty of garage storage solutions that you can use to create a custom garden station that will help keep both your garden and garage looking great all year round. Including a workbench in your garden station is ideal for those who want to give their plants a head start in the garage. Keeping small tools like hand-trowels on a slat board above your workbench will keep them handy when you need them, and your workspace free of clutter when you don’t. Bulky items that need to be kept dry and off the ground, like small bags of potting soil and fertilizer, can be kept in floor mounted cabinets below your workspace for easy access. Lighter items like 10” flower pots and garden stakes can be stored safely out of sight in wall mounted cabinets until your plants are ready to be moved out of their starter pots. Once the weather is nice enough to start working in the yard, you’ll need to use your heavy-duty tools to prep your flowerbeds. 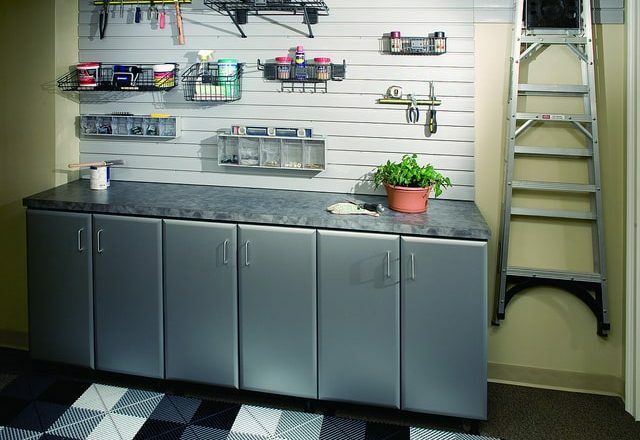 Garage storage racks help keep large collections of garden tools organized and out of the way. They can be customized to include baskets for small items like gloves and knee-pads, and hooks to hold heavier items like garden forks, shovels, and weed trimmers. Of course, you’ll also need storage once fall rolls back around. Storing dahlia tubers and other types of plant bulbs over the winter months requires special care if you want them to bloom when you re-plant them in the spring. Most need to be kept between 35° to 45° F, and away from excessive moisture. 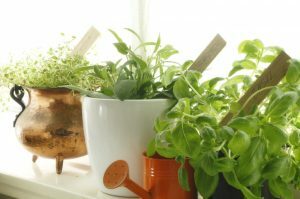 Storing them on custom shelving above your garden station during the colder months is a great way to keep them cool, dry, and away from pests. The custom storage solutions from More Space Place are crafted using the finest quality materials. If you’re ready to upgrade the storage in your garage or anywhere else in your home, go with the system you know will last for years to come. Contact your local More Space Place today and schedule a free, in-home consultation! Photo Credits: ©anich, © More Space Place.